Just say no. That’s what the first lady Nancy Reagan declared to the American public regarding the taking of drugs. Luckily for one man, Columbian Pablo Escobar, they didn’t listen. At one point, 80% of all the cocaine that made it into the good ole US of A, was supplied by Pablo. This of course, made Pablo a very rich man. It also made him enemy numero uno with the Drug Enforcement Agency. 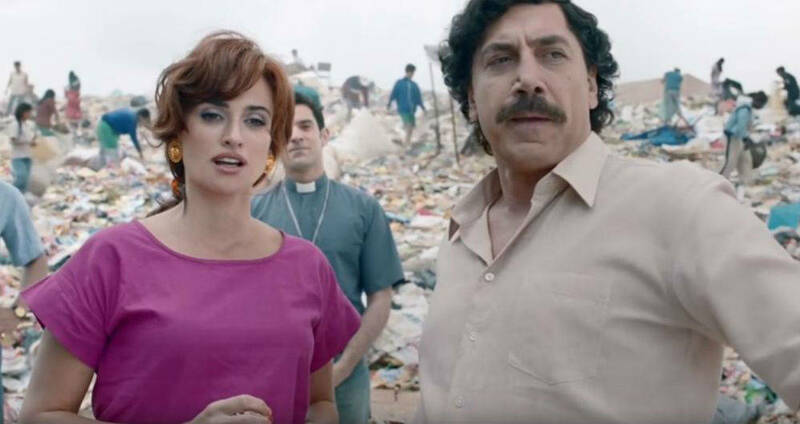 And although there have been a number of versions of his story told for the screen, this one is based on the book Loving Pablo, Hating Escobar, written by the journalist Virginia Vallejo, who was also his lover. That's why here's here, because i'm gonna build a church out of Coke cans. During the eighties, drug lord Pablo Escobar (Javier Jardem) and his cartel were virtually untouchable. Due to the appetite for their product – cocaine – in the States, he was literally worth billions. Although Escobar considered himself a family man – in the sense that he had one – he had an eye for the ladies. Needless to say, he could have anyone he wanted. This included the journalist who appeared on his TV nightly, Virginia Vallejo (Penélope Cruz), to read the news. Not only was she flattered to hold the attention of one of the world’s richest men, but as a journalist, also fascinated by his criminal activities. But although being involved with such a powerful man has his benefits, she soon discovers that it also has its many risks. Spanish director Fernando León de Aranoa should get some kudos for roping in the formidable talent of both Bardem and Cruz for his project. It’s disappointing then that their attachment is wasted on this flat and dull feature. The initial irking factor is that, despite the director and both main leads having Spanish as their mother tongue, as indeed the characters they play, the film is presented in English. It’s tragic to think that even with such a talented cast, audiences wouldn’t be prepared to turn up to watch it due to subtitles. It’s like watching the Beeb’s recent Versailles drama, set in France, where King Louis roams his palace speaking received pronunciation. Yes, that level of wrongness. It’s ironic then that they probably just stayed away because the film is so underwhelming. Aranoa seems unsure of what part of Escobar’s story to tell. Considering that it’s told with a voiceover from Cruz, her character, and more importantly her relationship with Escobar, doesn’t feature greatly. Instead, the director’s attention wanders off into familiar ground of portraying the tyrant in charge. What would have been more interesting instead, would have been an origins story, examining how Escobar came to be? What kind of upbringing did he have? What kind of relationship did he have with his own parents? Unfortunately Aranoa is more interested in going down that clichéd road of guns on show and victims hitting the deck. It’s a shame that such larger than life characters, played by such an impressive cast, resulted in this below par biography. A waste of talent, a waste of a unique point of view, and sadly, a waste of time.